In the framework of the investment theory of party competition, blocs of major investors compete with each other to control the policies of the state. The platforms of political parties reflect the interests of their major investors. Therefore, political parties are best seen as coalitions of major blocs. The goal of each bloc is, first and foremost, to defend its vital interests. Blocs mobilize resources and try to recruit allies when then compete over policy with rival blocs. Such balancing and alliance formation are suggestive of great power competition. We can therefore borrow the logic of balance-of-power theory from international relations and apply it within the investment theory of politics.1 As we will see, such a strategy will be useful in teasing out the logic of money-driven political systems. To wit, a political system consists of highly-organized societal actors called blocs that compete over state policy.2 Power is the aggregate capacity of a bloc to mobilize politically. In a money-driven political system, this is more or less equivalent to the aggregate financial resources at the disposal of the bloc. Blocs worry about defending their vital interests and balance more powerful blocs by increasing their mobilization efforts or seeking alliances with other blocs. One may restrict attention to the most powerful blocs of the system without loss of generality, since minor blocs are incapable of influencing policy in any significant way. Blocs care much more about certain subsets of the policy spectrum than others. That is, they occupy a specific ‘territory’ in the policy spectrum. Proximity in in the policy spectrum is the best predictor of alliance formation. Blocs that compete over the same policy portfolios are likely to be found in opposing alliances. One must distinguish between highly-contested and relatively uncontested subsets of the policy spectrum. Over a policy space with a decisive constituency, i.e., a bloc of deep-pocketed investors with a vital interest facing limited opposition from other blocs, the price of policy will be low and the policies themselves will be consistent and predictable as long as the bloc remains dominant. This is because lawmakers compete with each other for the patronage of such lobbies. Examples that immediately spring to mind are military firms for the Pentagon budget, banks over financial regulation, oil majors over environmental regulation, pharmaceutical companies over prescription drug prices, and so on and so forth. Over highly-contested policy spectra, we will find balancing behaviour akin to great power competition. Such contests will spill over into partisan fights as opposing coalitions of major investors fight it out to protect their interests. The rise and fall of blocs – the law of uneven growth – undermines the stability of the political system. Rising blocs seek to challenge the status quo upheld by dominant blocs, until a ‘hegemonic war’ reorders the political order, determining which blocs will govern the system. The maneuvering for oil, tea, cotton, coffee, and other commodities has brought billions to investment banks like Goldman Sachs, JP Morgan, Bank of America, Barclays, and Morgan Stanley. The Federal Reserve is now considering whether to revoke a series of approvals allowing banks to trade not only commodity derivatives from computer screens, but actual commodities from docks, tanks and pipelines. It is unlikely to reign in the banks, or so one would expect given the balance of forces in play. In 2012, the combined profits of the food, beverage, and tobacco industries were only $45 billion, while that of the financial sector were half-a-trillion dollars. In order to evaluate the stability of a given party system, the foregoing analysis suggest that one must analyze the evolution of the system structure: the distribution of power among blocs. Evaluating the capabilities of blocs is, by necessity, an imperfect exercise. We shall use a proxy variable, corporate profits, to measure the relative power of different blocs.3 As we will see, this will shed light on both the stability of the party system and the gridlock in Washington. 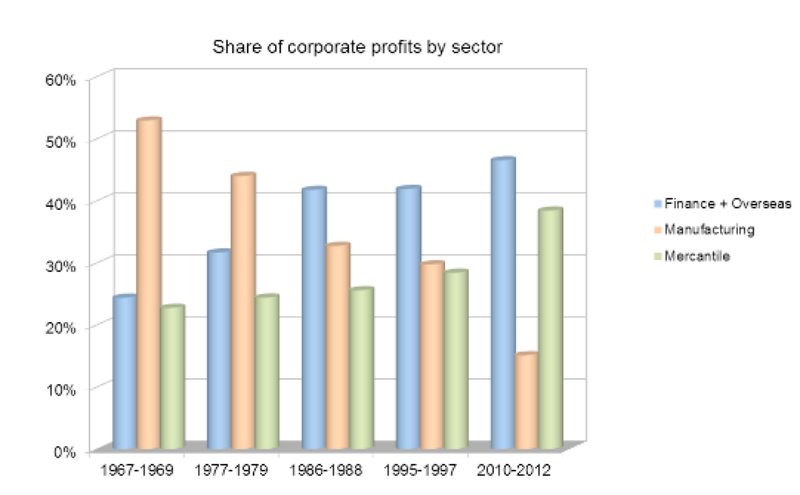 The chart below shows the share of corporate profits of the three major sectors of corporate America. The three-year-periods are chosen so as to exclude recessions and bubbles. In 1967-69, the dominance of manufacturers is manifest. Comparing 1977-1979 and 1986-88, we can see the take-over by the new hegemonic bloc of finance and multinational firms with significant earnings overseas. The situation is unchanged in 1995-1997, while 2010-2012 reveals the rise of a new power on the scene. This is the nationally-oriented mercantile interests comprised of retail trade, wholesale trade, transportation, utilities, and other nonfinancial corporations. The gridlock in Washington is being driven by the resurgent reactionary wing of the Republican Party. A careful look at the changing GOP coalition reveals the dynamic in play. A number of rising mercantile interests are behind the insurgency in the GOP. At the forefront are retail interests led by Walmart and Home Depot, following closely by transportation, chemical (Koch brothers), gambling (Sheldon Anderson), wholesale trade, and the food and beverage industry. The traditional major investors in the GOP coalition – oil, defense, agribusiness, and the nationally-oriented manufacturers – are more than happy to help in bankrolling the insurgency. The theory thus allows for a novel perspective on the gridlock in Washington. Decomposing the policy spectrum into uncontested and contested spectra, we observe that the core politico-economic policies of the US state are themselves uncontested: security, foreign, finance, monetary, and trade portfolios. This is because the hegemonic bloc is decisive over this vital subset of the policy spectrum. 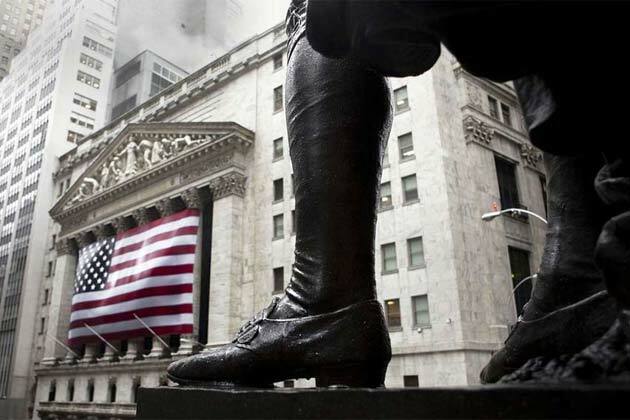 The stability of the system of 1980 is closely-tied to the primacy of Wall Street. It is a major investor in both parties which makes the party system more stable than previously recognized.9 The institutional capture of the holy trinity of the monetary-financial apparatus of the US state by Wall Street makes the core policies of the neoliberal order robust to secondary instability in the party system.10 Foreign and security policymaking – institutionalized at the Council of Foreign Relations – are also largely uncontested. The policies of the US state emanate from tightly-knit sectors of wealth and power. We should be trying to explore the precise mechanism through which the interests of the powerful are translated into policy. 1 This is natural since neorealism is just market theory applied to international politics in the first place. See Waltz, A theory of international politics. 2 The international system consists of sovereign states that interact in anarchy. That is, each state fends for itself and there is no night-watchman to protect the states against their militarily stronger rivals. States try to maximize power in order to ensure their long-term survival. They balance their rivals by increasing their internal efforts or seeking alliances with other powers. One may restrict attention to great powers without loss of generality, since minor powers don’t matter in the global balance of power. Moreover, power decays over large distances. The best predictor of alliance formation is proximity. States fear powerful neighbors more than faraway great powers. Therefore, states that compete over the same territory are likely to be found in opposing alliances. The rise and fall of great powers – the law of uneven growth – undermines the stability of the international order. Rising powers seek to change the status quo upheld by dominant states, until a hegemonic war determines which states will govern the system. The principal explanatory variable of the theory is the system structure. That is, the distribution of power among units. To evaluate the stability of a given system, one analyzes the evolution of the system structure. 3 The data is taken from The Economic Report to the President, 2013. 4 Kocieniewski, David. “A Shuffle of Aluminum, but to Banks, Pure Gold.” New York Times. July 20, 2013. 5 “Goldman Relents in Metals Warehousing Row.” Financial Times. Web. 15 Oct. 2013. 6 Hacker, Jacob S., and Paul Pierson. “Winner-take-all politics: Public policy, political organization, and the precipitous rise of top incomes in the United States.” Politics and Society 38.2 (2010): 152-204. 7 Duménil, Gérard, and Dominique Lévy. The crisis of neoliberalism. Harvard University Press, 2011. 8 This quote is attributed to New York investment banker Andrew Mellon, who served as the Treasury secretary from 1921-1932. 9 The system of 1860 was dominated by the Republican Party. The hegemonic bloc, the railroads, only had to bankroll the Republicans. This made the system less stable. Grover Cleveland, the only Democrat to occupy the White House between the Civil War and the First World War, rose to power by attacking the declining railroad interests. Such an opening is unavailable in the present system, since finance bankrolls both parties. 10 The holy trinity that governs the global monetary-financial order is the United States Federal Reserve, the US Treasury, and the Federal Reserve Bank of New York. The last is effectively the liaison office of the US state with the big banking firms. event that credit damage exist. I have joined your rss feed and look forward to in search of moree of your wonderful post.